This category of articles is where it all began here at The Fun Times Guide. We started sharing strange and funny things... and we haven't stopped! From funny videos to funny pictures and everything in between. Funny Church Bulletin Announcements And Church Signs + A Free Online Church Sign Maker! 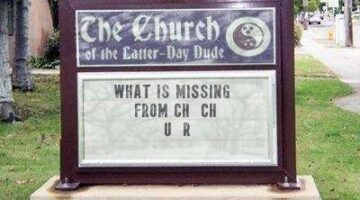 Funny church announcements + Funny church signs. Now you can make your own personalized church signs with this FREE church sign maker! I was definitely in the right place at the right time to capture these funny pictures of cars – and drivers! 15 funny photos of cars & their drivers that are hilarious. Clever company logos with hidden messages, symbols & meanings disguised inside them. Can you spot them? See what some famous business logos REALLY mean! You know me, I always have my camera — even at times when I probably shouldn’t, like when people are saying prayers. And little Karly is just like her Aunt Lynnette when it comes to saying prayers: we never closes our eyes! Instead, we both need to be keenly aware of what’s going on around us at all times. This was too funny not to photograph! A list of online videos that will motivate you or just make you smile and feel happy to be alive. Enjoy! Best Workout Videos Gone Wrong – Funny Accidents Caught On Tape! The Internet is loaded with funny workout videos which highlight bloopers, accidents, and things gone wrong when exercising or training. These are the BEST workout videos gone wrong. This collection of online videos is guaranteed to have you rolling on the floor laughing! Check out the video footage of these guys as they jump from extremely high places on Earth and then soar through the air at speeds of up to 140 miles per hour. There is one overhead view of 2 of them before they jumped that is simply breathtaking! VIDEO: Dad Catches Foul Ball, Daughter Throws It Back! The best part for both dad and daughter… not only was this video shown on TV news and sports programs all across America, but now it’s also making the rounds on the Internet! Their 15 minutes of fame brought smiles to millions of people today. Looking for ‘all the best’ or ‘the top’ things in a particular category? The site called Fimoculous tracks all the best lists that appeared in a particular year. Sometimes the stars — and the moon — line up just perfectly where you’re in the right place… at the right time… with a camera. Many thanks to Gregg K. who sent us the latest list of Bud Light Real Men of Genius commercials, including various regional appearances for RMOG radio and TV spots.The years of release are listed, as well. Here are a few funny videos that were taped during QVC or Home Shopping Channel on-air live programming. These funny videos featuring accidents, bloopers, and random mishaps which took place on one of the home shopping channels. You’ve gotta love live TV… you just never know what’s going to happen next!